Cost: Average spend is around £20 per person. Cooked dishes range from £6 to £8, with pastries at £1.50, granola and doughnuts at £3. Boozy cocktails, Breakfast Bellini and Bloody Mary, are £6 while a whole bottle of Polpo Prosecco comes in at a reasonable £16. Coffee, whether cappuccino, double espresso, latte, or flat white, is all priced at £3. Breakfast tea is £2. 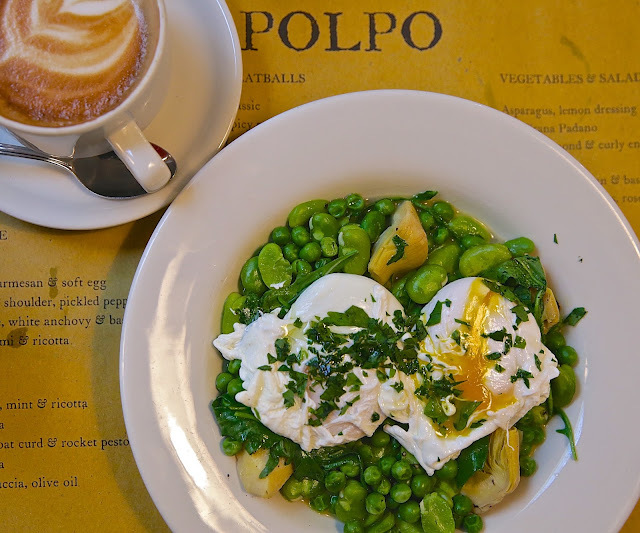 About: Opened by restaurateur Russell Norman in 2009, Polpo Soho was the first branch of several that have slowly spread across London and beyond. Sister restaurants are Polpetto above the French House in Dean Street, da Polpo in Covent Garden, and Spuntino on Rupert Street. Polpo is known for its small-eats and informal dining style for lunch and dinner, that was somehow ground-breaking when it first appeared. As of June 2016, it also offers brunch on Saturdays, Sundays and Bank Holidays from 10am to 12.30pm. What We Ate: The menu is concise, with four cooked options, plus pastries, doughnuts and granola, and a range of hot and cold drinks including a couple of breakfast cocktails. We started with the soft poached eggs served on a bed of scafata (£6). Scafata is a traditional stew from Umbria in central Italy, made from fava beans and spring vegetables which may include Swiss chard, asparagus, peas and onions and sometimes pancetta or salsiccia. Polpo’s version had beans, peas, rocket and baby artichoke hearts. It was a stunning-looking dish, rather like spring on a plate, with perfectly cooked beans and vegetables, and oozy, runny eggs, but it sadly lacked seasoning. I have seen scafata recipes with Pecorino cheese or pancetta, and I think the dish would have gained from the addition of either. Better was the brunch pizzetta with Italian salsiccia, wild mushroom and a soft egg (£8). With a fine thin crust and a scattering of fennel seeds, it came with top quality Italian spicy sausage, and slices of thick-cut pancetta, marbled with wonderfully aromatic, savoury fat - this was the highlight of the brunch for me. Polpo's posh mushrooms on toast had wild garlic, an array of mushrooms (I think oyster, closed cap and perhaps porcini) topped with crumbled ricotta and a scattering of parsley, served on thick wedge of toasted sourdough (£6). I liked this but it didn’t rock my world – the bread had a great texture, but the mushrooms, though in abundance, were a tad uninspiring in flavour and texture, and again lacked seasoning. To wrap up, we had the ricotta doughnuts and cinnamon sugar (£3). I enjoyed these mini doughnuts – they were fluffy, light and cinnamony, but would have been greatly improved by something served alongside like jam or clotted cream, or even some ice cream. What We Drank: The Breakfast Bellini (£6) with a dash of Prosecco was sweet, peachy and refreshing. I also enjoyed the spicy Bloody Mary (£6), which was well seasoned with Tabasco and black pepper. Likes: The brunch pizzetta is delicious - a simple dish elevated by the use of some top quality Italian ingredients. Dislikes: Service was in my opinion poor - the staff were not terribly friendly and an occasional smile would have gone a long way. They were uninformed about the dishes too – for example, nobody could explain which mushrooms were on the mushrooms on sourdough, one of only four cooked items on the menu. Besides, the seasoning of some of the dishes needs looking at. Verdict: A perfect brunch for me at Polpo Soho starts with a spicy Bloody Mary, accompanied by the Italian pizzetta, some strong coffee and a couple of their moreish sugar and cinnamon doughnuts slathered with a good helping of clotted cream or jam, if available. Ricotta doughnuts sound delicious! Although, I agree probably need a little something extra on the side like ice cream, or full on cream. Yum!